It appears fashionable these days to blame capitalism for all that ails modern society including inequality, environmental problems, global warming, extinction of animal species, unemployment, healthcare costs etc. Everything miserable is somehow caused by capitalism. One thing is clear: those who articulate these views have no knowledge of either history or economics, and their facetious arguments are designed only to show others that by being critical of this noxious vice called ‘greed’ that they somehow sit on a higher moral ground. It is therefore not surprising that a recent report by a UK-based charity, Oxfam, claims that inequality in India is rising and that 73% of the wealth in India went to the richest 1%. Cries of inequality, and the “rich getting richer” get shriller anytime such claims are made. But reports like this distort both the meaning and the moral significance of inequality. Little attempt is made to understand the real genesis of inequality. But first a word about the Oxfam report. Oxfam is a charity that raises millions of dollars using titillating reports like these ( which predictably are always released around the Davos event to generate the maximum effect). Their financial statements reveal that an astounding 21% of the money they raise goes towards exorbitant salaries. Executives of the charity have been accused of embezzling funds, sexual abuse, and even a recruiting scandal. Oxfam does not reveal how it calculates inequality and so it is impossible to check the accuracy of its statements. But it is clear that they have fudged the data. The original Credit Suisse data that the Oxfam report uses to calculate wealth inequality indicates that the top 10% –not 1%–own 73% of the wealth. Of course, since 10% is a lot less jarring than 1%, Oxfam conveniently dropped the zero. What is really bizarre, however, is their conclusion blaming economic liberalization and capitalism for this inequality. Of course, the report conveniently ignores the fact that it was the economic liberalization and the move to free and open markets in 1991 that has pulled over 300 million Indians out of poverty and raised the living standards for an entire nation. Prior to 1991, the Indian poverty rate was stubbornly stuck at around 47% for almost forty-five years. Half of the country was perpetually poor. Miraculously, free-market economics changed all that and now the number living in poverty has dropped to around 12% in twenty-five years. That’s the transformation that capitalism has brought to India that reports like Oxfam deliberately ignore because their intent is to capitalise by selling misery. A charity obviously can’t raise money without misery–the more they exaggerate it the more money they raise for themselves. 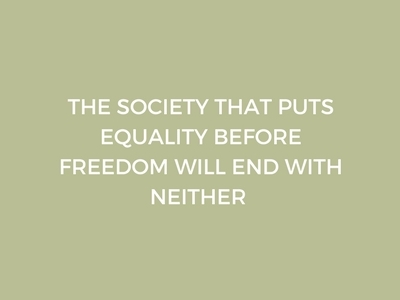 The notion of inequality is deeply troubling because it jars our sense of fairness. But is it the inequality that bothers us or the fact that some people don’t have enough to sustain themselves? Would differences in income matter if everyone had enough? Would we, for example, be as concerned about the disparity in income between a billionaire and a millionaire? And is there something morally wrong with some people earning more than others as long as that money is made in a fair and free market and not through fraud and abuse of power? The misplaced focus on income inequality is a dangerous distraction from the real problems that face the poor: lack of economic opportunity, large differentials in educational and skill levels, and systemic injustice. A careful and unbiased analysis of the data reveals that the world today has the lowest level of poverty, the highest standards of living, and the lowest disparities in consumption and happiness than any time in history. Not long ago the entire wealth in most nations was controlled by one person–the king. The vast majority of people lived in extreme poverty and only a tiny elite enjoyed high standards of living. With the growth in personal and economic freedom, millions worldwide have been lifted out of poverty. World Bank Statistics show that the percentage of people living in absolute poverty has dropped from 60% in 1970 to less than 10% today, despite a more than doubling of the population during the same time. In other words for centuries the only condition know to mankind was poverty. But in the last fifty years, much of this poverty has been wiped off. This miraculous increase in welfare has been brought about by capitalism, free markets, and higher levels of economic freedom.The record of economic history is unequivocally clear: There is no better way of improving the lives of ordinary people than the productive activities unleashed by a free enterprise system. In an ideal world inequality is undesirable, but in the natural world, inequality is inevitable. People have different levels of ability; some take more risk than others, some are more innovative, some more productive, and some just plain smarter than others. It is, therefore, a statistical certainty that people will end up dispersed over a wide range of economic outcomes. But while these technologies will increase inequality they will also enhance the quality of life for everyone. Internet and high-speed data may have made a librarian redundant but they are now allowing millions of children in faraway places access to the highest levels of knowledge. Genomics and cell bioengineering are making medicines that save millions from life-threatening diseases, and new technologies are providing safe energy and helping reduce harmful pollution. Food is now being grown in areas where nothing has grown for a million years, and connectivity is bringing the world together. The concern, therefore, should not be inequality but what causes it. If inequality is the byproduct of the wealth creation process where innovative entrepreneurs are creating fortunes from new products and services that are changing peoples lives, then it is a welcome sign of growth and prosperity. But if the inequality is being created because a group of people have access to the levers of power and monopolise wealth–as in countries like Venezuela–then it is a cause for concern. Therefore, it is not enough to identify the presence of inequality–an additional argument is required to show that there are injustice and wrongdoing involved. There is also a problem with the way inequality is presented because it is made to sound like large-scale impoverishment. Statistics on income inequality paint a grossly misleading picture of real standards of living and well being. Take the Gini coefficient, for example. It is the most commonly used measure of inequality. It is scaled from 0 to 1, with 0 being perfect equality–everyone making the same income–and 1 being complete inequality where one person has all the wealth, and the rest have nothing. The US and Uganda have roughly the same Gini coefficient of 0.45 but do these countries have the same level of prosperity. Clearly not. On the UN Human Development Index –which measures prosperity and quality of life– the US is ranked 3rd and Uganda 161st out of 187countries. The dispersion of incomes, therefore, has a very tenuous connection to human welfare or social justiceLow inequality does not mean higher standards of living. Instead, if we shift the debate from inequality to reducing poverty and increasing opportunities for the poor then our focus shifts to getting people at the bottom up to standards of employment required for the modern economy. This requires increasing economic freedom, minimising government control over resources and means of production and building up the institutions responsible for human capital formation–higher investments in human capital, better schools and higher institutions of learning, higher R&D, more on-the-job training etc..
We have a choice: should we focus on growing the pie and building wealth so that everyone gets more or should we be fixated on ways to divide the existing pie and in the process dissuade wealth creation. We would be naive to ignore the lessons of economic history that we have to first create wealth before we can divide it. Do we want the unequal wealth creation and the improved standards of living from free markets and economic liberalization or do we want the equal misery that comes from socialism, big government and central planning? Most would agree that India cannot afford to stray from the path of economic freedom that has pulled 300 million Indians out of poverty and go back to the days of 3% growth, and 45%poverty. India cannot adopt redistributive policies that encourage the development of a large welfare class entirely devoid of any marketable skills and utterly dependent on the government. More importantly, by wrongly blaming capitalism for inequality we are shifting our focus away from the single biggest cause of inequality: big government. It is big government that drives wealth towards those who have the wherewithal to manipulate the levers of government. The greater the share of a nation’s wealth that the government controls, both directly through state-owned enterprises or indirectly through regulations, the greater the opportunity for those in and around government to amass wealth. Almost 90% of the politicians in India are multi-millionaires in a country where 85% of the people make less than Rs. 10,000 per month. The inequality in much of Africa comes not from free markets and entrepreneurship but from the total control that big powerful totalitarian governments have over the country’s economic resources. It is this inequality that we need to guard against because it comes not from innovation, economic freedom and entrepreneurship but from abuse of power. And this is the inequality that comes from the alternatives to capitalism: socialism, communism, totalitarianism and dictatorship. Those who are morally opposed to greed should be prepared to live and work under fear because the two primary emotions that drive human behaviour are greed and fear.